I have a list. A long list. It is in my head (I really need to write it down I might sleep better). I am trying to mark off the smaller items before my parents get here which is in 5 days. I have made alot of progress. Erin and I decided this year to do something different for each other for Christmas. We have never talked about what we are getting each other but this year decided to make mini quilts. 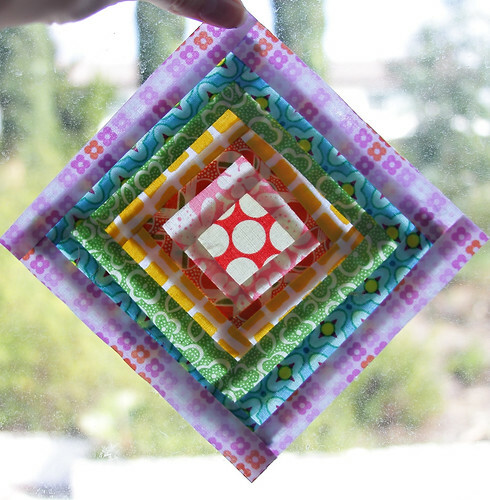 I started making small squares in rainbow colors which are both of Erin's favorite. I made her this mini but then after binding it I was not completely happy with it. It was to small and had things in it I knew Erin wouldn't like so I decided to start over and keep this one for myself. It looks great on my sewing wall. 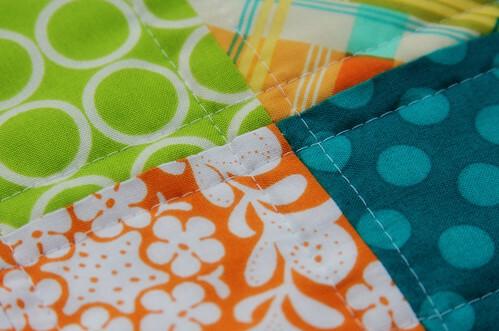 I do love the straight line quilting that is Erin's favorite! Then I started another one for her that I love and I am completely happy with but I will have to show you a picture of it after she receives it. Here is a small peek. I signed up for a secret Santa swap among some of us on twitter. I am completely happy with my partner and knew exactly what I wanted to do. We did not have to make something we can buy something as our gift but I was in the mood to make my partner their gift. As you know I am obsessed with the Interlocking Stars pattern and I can't get enough of it. I thought it would be a perfect fit for my partner. The mini quilt is along the larger side at 19.5" x 23.5" . I used Kona Ash since I thought my partner would like that instead of my signature white. I usually don't do anything on the back of mini quilts since they get hung up on walls and you never see the back anyway but I had some extra squares so I though I might as well use them. 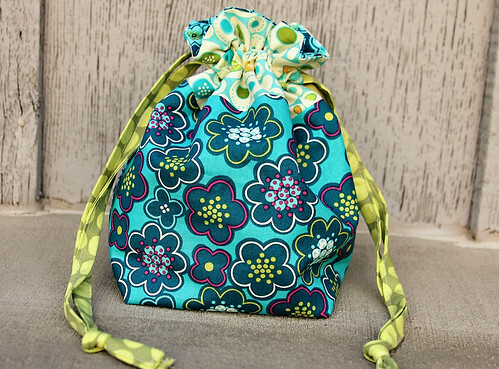 I have also been dying to make Jeni's awesome drawstring bags since she made one for Sewing Summit. Then she made a great tutorial. I finally got around to making both of my girls one. The only thing that is a pain is making the bias tape I hate making that it takes forever. I am so buying ribbon the next time I make one. Which probably won't happen since I make things last minute and won't want to run to the store LOL. Gweniveve is a blue girl. Remember this quilt for her? So it was easy to make hers. Penelope as you saw on my post yesterday, loves Minnie Mouse. I do not buy Disney fabric, to much for me, so I decided to do my own take on Minnie for hers. 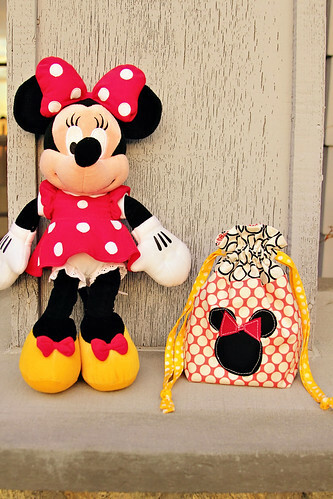 I raw edged appliqued on the Minnie which is totally not perfect but hey she is only 2. The girls were in heaven. All day they carried around their bags and used the ties to carry them like backpacks and kept putting little fun things inside. This is why I sew. I love when people enjoy the things that I make. 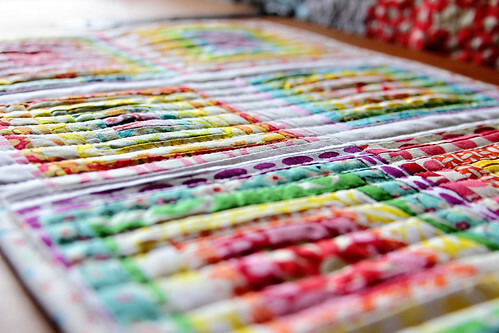 Your quilts are amazing! 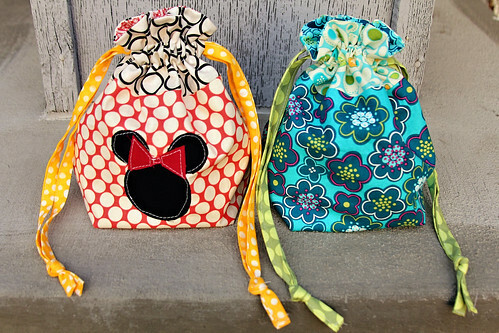 Love the bags too. You're having entirely too much fun over there! Oh, what amazing projects! I love them all. and your minis are gorgeous! I love everything you have made here. The minis look wonderful. I love how all of your projects have such amazing pops of colours. Just beautiful. 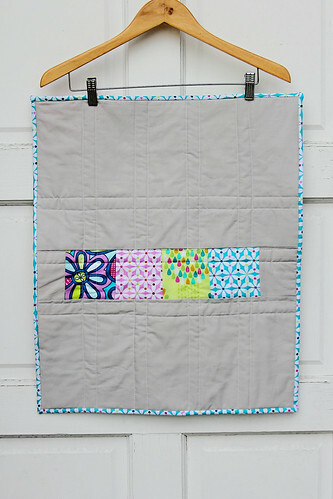 Love the mini quilts and I can't wait to see more than a sneak peek of the one you sent to Erin! 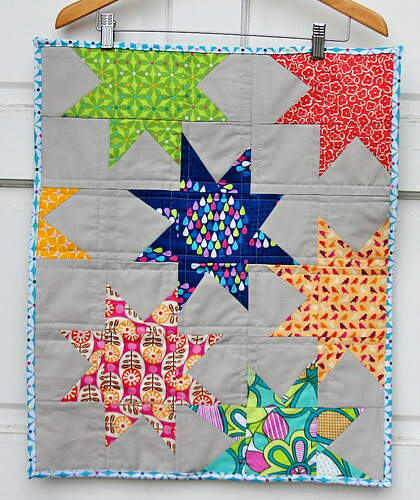 i adore the stars mini quilt- i know i am behind, but what pattern do you use? 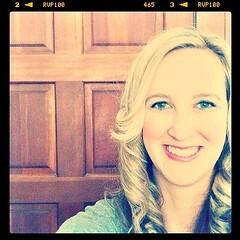 your color choices are spot-on too, by the way- it looks great with ash! Gorgeous projects! Lovin' the bright colours and mod prints. 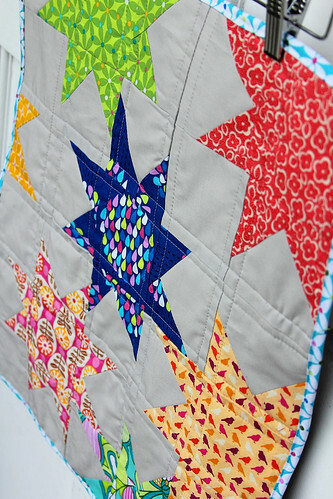 The star quilt is gorgeous. 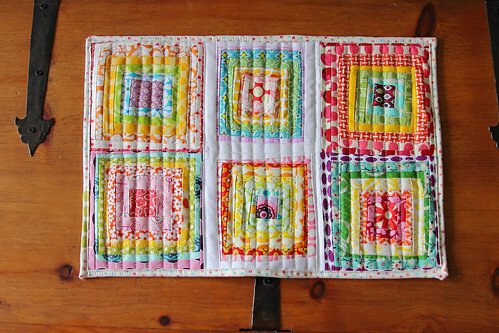 I confess I have always hated star quilts until I saw what you did with them.